Some of you might remember a couple of weeks back I popped into Aqua Beauty to have a facial. I opted for the SkinBreeze facial as it was something I had never tried and had heard so much about. Aqua Beauty is the only salon in Ireland that does this treatment. I wanted to share my experience with you. I know some of you will want treat your skin to something luxurious this new year. This is the one for you. 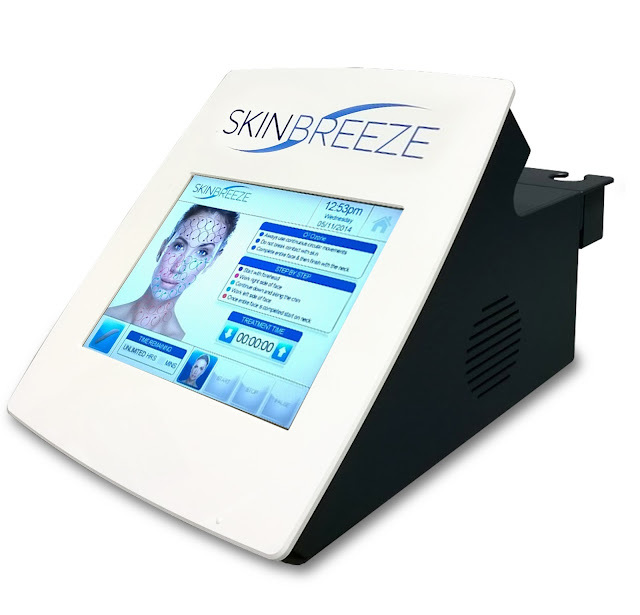 The Skinbreeze facial is a 60 minute non invasive facial that helps to hydrate, plump out and rejuvenate the skin. I think I need to book in for a second one now after all the bad yummy food and late nights over Crimbo. My skin is looking a bit tired. This treatment is amazing for anyone with dry skin, ache prone skin. It is great for brightening and tightening and has brilliant anti ageing results. The owner Michelle did my facial and it was one of the nicest, most relaxing facials I've ever had. It also included a head, shoulder and foot massage. I think at one point I actually fell asleep haha. If you are looking to treat yourself or to get a fab gift for someone special I definitely recommend popping into Michelle in Aqua Beauty and having the Skinbreeze facial. For more info and to book in click here.